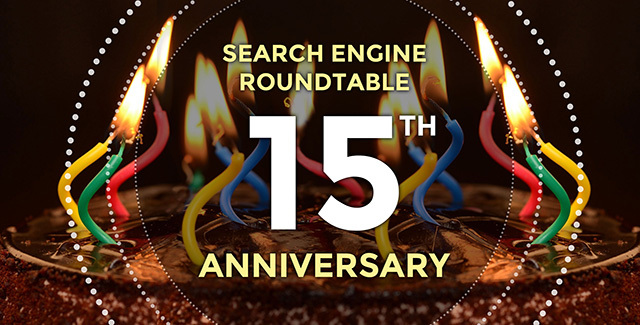 15 years ago today was the first time I wrote a blog post on this site, the Search Engine Roundtable. Since then I have continued to write daily, almost without any time off, every single day of the work week. It is a passion I had no clue would last for 15 years, but I continue to love doing on a daily basis. I say this every year, but I am so happy to say the original purpose behind the site has not changed since day one. I still cover the search industry, what they are talking about, and try my best to catalog that history on this site. Covering what the SEOs and SEMs are chatting about in forums or on social media, I think, helps everyone in the community see what is on top of mind within the community. Be it Google algorithm updates, new advancements in voice search, AI, paid search and so much more - I hope that you can find what you need here on a daily basis. In short, what is covered here is simply what you, the industry, is talking about on a daily basis - this site just brings more awareness to that. I still average about five stories per day here, that does not include what I write at Search Engine Land. I rarely take off any days and when I do for religious reasons, I try to schedule stories for those days. Consistency is very important to me and in everything I do - thus most people know they can find fresh new stories here every Monday through Friday between the hours of 7am and 8:30am EDT. Over the years I've tried to get more creative with my story images, heck, I've been using more animated GIFs there as well. I keep my weekly SEO video on Fridays, I post my daily search picture and I try to never miss the monthly Google webmaster reports. This year was an espesially humbling year for me - I was some how awarded the US Search Personality of the Year award. I suspect it had to do with the tough year the industry had in general with losing so many people we love. I don't want to get into all of the sad that happened this year, but overall - we have amazing people in our industry and they deserve a thank you. You can read my 14 year recap also if you would like. While last year our traffic was up over 12%, this past year it was up over 15% year over year. Organic search traffic grew 10% year over year, referral traffic was up 11%, direct traffic over 35% up, and social media was up 9%. Our mobile traffic is about 40% of our visits with 60% still being desktop, that didn't change much from last year. Also our US traffic was up 30% this year, which is very interesting to see. There are now about 27,000 stories on this site, which about 24,000 of them I wrote myself. In the past year, I posted over 1,850 stories, with over 11,000 non-spam related comments in a year. Keep posting those comments, I did make an effort to remove more of the abusive comments this year, which is why comments are down from the previous year. I will keep trying to be better with comment moderation. The Google Project Beacon - Did You Get Your Beacon? Let's forget about mobile - that was so the past few years. AMP also, that was 2017 and 2018. The future is really about voice search and voice assistants. Google Home devices, Google Assistant, Amazon Alexa, Apple Siri, Microsoft Cortana - but clearly Google is the big player here. How to get your content in featured snippets, getting your videos in the Google Home Hub display, using speakable markup and so much more. Structured data, was important the past few years and is ever more important here. You want your phone, your computer, your car, and your microwave to give you results from your web site - when relevant. And by voice I mean not just reading the answers but showing you the answers if there is a display on your assistant device. So I would double down on figuring out voice assistants, with a focus on Google Assistant and Google Home devices. I deeply appreciate and thank you all so much for reading every day, commenting (or ignoring the comments) and for sharing the stories here. Keep up the chatter and let's build an even better search community this coming year.